Wood Sculptures by Riel Hilario in Aniwaas opens on September 3, Thursday, 6pm. Sculptor Riel Hilario reinterprets the folk belief in the animating spirit in Aniwaas, an exhibit of his recent sculptures in wood. Aniwaas is an Ilocano term for the earthbound spirit. In ancient Ilocano mythology the aniwaas is one of the four souls believed to comprise the life-force of a living person, which is left behind in the earthly plane in the transition to the afterlife. Being fully attached to its former existence, the aniwaas lingers within its familiar environs and is said to inhabit the bodies of small animals, insects and even statues or pictures. For the artist, the animating principle of the aniwaas is a creative process in sculpture where the maker’s thoughts, memory and consciousness take residence in forms. The sculptor engages the concept of the aniwaas as a metaphor for the residual consciousness that lingers after the creation of a work, which brings an affective presence or living sense to the form. For Hilario, his aim as a sculptor is to make sculptures that “seem to exist on their own will”. Aniwaas is the second of a series of wood sculptures on the four Ilocano souls, following his show Kadkaduwa in 2005. The exhibit is the artist’s eight solo show. Hilario studied santo-carving under Jose Lazo Jr. in Ilocos Sur in 1994 and took up painting and art history at the University of the Philippines. His wood sculptures were featured in the national traveling exhibit Sungdu-an 3 in 2003, a project of the national Commission for Culture and the Arts. 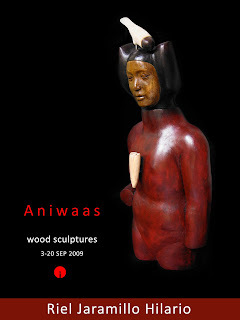 Aniwaas runs from September 3 to 20. For inquiries please visit www.artinformal.com or call (632) 7258518. Art Informal, an artist-run center for art education and exhibitions is at 277 Connecticut St., Greenhills East, Mandaluyong City.